FILE - In a Saturday, Dec. 16, 2017 file photo, President Donald Trump talks with reporters as he departs from the South Lawn of the White House. U.S. President Donald Trump says it "seems unlikely" that he would need to meet with special counsel Robert Mueller about Mueller's investigation into allegations that Trump's presidential campaign had ties with Russia. Trump made the comment Wednesday during a news conference after a meeting with Norweigian Prime Minister Erna Solberg. Mueller has reportedly indicated to Trump's lawyers that his team would like to interview the president as part of the investigation. Trump has called the investigation a "Democratic hoax." So far, the investigation has resulted in the indictment of former campaign chairman Paul Manafort, and a guilty plea from former National Security Advisor Mike Flynn. 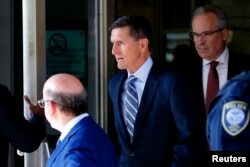 Former U.S. National Security Adviser Michael Flynn departs U.S. District Court, where pleaded guilty to lying to the FBI about his contacts with Russia's ambassador to the United States, in Washington, Dec. 1, 2017. 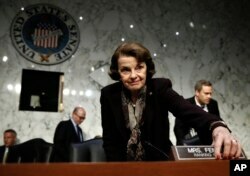 Trump also assailed California Democratic Senator Dianne Feinstein, calling her "sneaky" because on Tuesday she released a transcript of an August interview with the head of a firm that produced a dossier containing allegations about Trump's presidential campaign and Russia. Glenn Simpson, co-founder of the research group Fusion GPS, said he gave the dossier about Trump to the FBI because he was "very concerned" about a potential national security matter. Feinstein released a lengthy transcript of Simpson's testimony without telling the majority Republican bloc on the committee. Feinstein said Simpson requested the transcript of his testimony be released to the public and that the American people deserved the chance to see his words and judge for themselves. Simpson's firm hired Christopher Steele, a former British spy, to produce the dossier, and that research was paid for by Democrats, including the campaign of Trump's election opponent, Hillary Clinton. Senate Judiciary Committee ranking member Sen. Dianne Feinstein, D-California, arrives for a hearing of the committee, on Capitol Hill in Washington, Dec. 6, 2017. U.S. intelligence agencies assessed last year that Russia had conducted a campaign targeting the election with the goal of hurting Clinton's chances of winning while boosting Trump. In addition, Mueller is investigating whether Trump obstructed justice by firing former FBI chief James Comey when Comey was heading the agency's Russia probe before Mueller was appointed to take over the investigation.